Dragonsinger is the sequel to Dragonsong and the second book of the Harper Hall Trilogy. In the main Pern timeline, it occurs roughly at the same time as the later sections of Dragonquest (the second novel of the Dragonriders of Pern Trilogy). 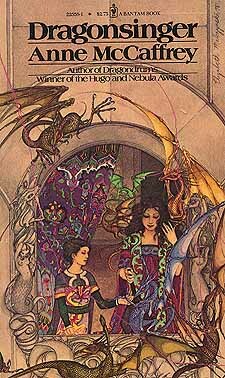 It continues Menolly’s story from the ending of Dragonsong as she arrives at the Harper Hall to begin her new life as a musician. It is highly recommended that one read Dragonsong before reading Dragonsinger. To understand the development of the story, I recommend reading my review of the first book, which may be found HERE. The first book apparently resolves the most serious of Menolly’s problems, but one should keep in mind that she is still entering an unknown world – the world of the Harper Hall – and she is not at all prepared for it. Although she has received detailed training in all of the basic skills of being a musician on Pern, she lacks good voice training and tutoring under a master composer. In addition, she has not been socialized into the culture of musicians and she carries a burden of extremely low self-expectation. It is not uncommon for the abused to bring low self-esteem into any performance situation and Menolly is just at the beginning of her journey to self-confidence. Certainly, her entrance on the Harper Hall stage is dramatic. She arrives on dragonback, accompanied by Masterharper Robinton, who immediately declares that she is the missing composer they have been searching for – and that she has provided fire-lizard eggs for himself and his Journeyman Sebell. The bronze dragonrider, T’Gellen, sensing Menolly’s discomfort, tells her that there is nothing to fear from Harpers and that within a sevenday the Harper Hall will be home. These are things that she will think about in the days to come. The novel tells the rather simple story of Menolly’s adjustment to her new life, both the difficulties and the triumphs. Among the difficulties she must face is the jealousy and disdain of the handful of girls she must live with in the cottage assigned to her. While Menolly is a full Apprentice to the Craft, the girls are strictly amateurs, their tuition paid by their wealthy families as a part of a larger liberal education. They will never be professionals. There is only one girl among them, Audiva, who has the temerity to befriend Menolly. Another difficulty is overcoming the prejudice of the instructors. Master Morshal, the instructor in musical theory, does not like Menolly’s songs and considers it presumptuous for a female to make the attempt at becoming a Harper. Although equally as skeptical, Master Domick, the Composition instructor, is open-minded concerning her talent. The headwoman Silvina helps her to settle in and becomes a mother figure for the girl, while one of the youngest apprentices, Piemer, helps her to adjust to the practices of the hall. Her voice instructor, Master Shonager, is a strict disciplinarian, but he cares about the development of her voice and he works hard to make her a great singer. But her strongest champions are Master Robinton and Journeymen Sebell and Talmor. The Masterharper supports her through his constant encouragement and sharing his ideals of what the Hall should be and should do on Pern. Sebell and Talmor provide a mature friendship support that makes her feel at home. There are several amazing scenes in the novel. The first two scenes occur one right after, beginning with her first practice with Domick, Sebell, and Talmor of Domick’s new composition. Even though he has played with her once before on a more simple composition, he is amazed by her ability to sight read music. Even the two journeymen are quite impressed with her musicianship. What gives the scene real emotional power, however, is that Domick has labored largely unappreciated as a composer and Menolly sees at once how beautiful his composition is and tells him that playing it was like riding on the back of a dragon. He is so touched that he completely softens toward her. That scene ends with the blaring of tocsin because Thread is immanent. When the midday meal is served, it rings again because Thread is directly overhead. Menolly’s fire-lizards become extremely agitated, so in order to calm them the entire dining hall, all of the apprentices and journeymen, are encouraged to sing. The fire-lizards sing along and when the first song is finished, Journeyman Brudegan encourages Menolly to lead the entire chorus in the singing of “The Ballad of Moreta’s Ride.” Conducting such accomplished voices becomes almost a mystical experience for Menolly who becomes so lost in the music that it takes a while for her to come back to reality once it is over. The next great scene is the only one that directly intersects the main story told in Dragonquest, that being the experimental trip that F’nor takes to the Red Star to see if they can go there to destroy Thread at the source. It is the first instance in any of the Pern novels that the fire-lizards not only possess a kind of joint consciousness, but that they also possess a joint memory (as a species) of events which have transpired in the far-distant past. Menolly’s fire-lizards become highly agitated as they sense that there is great danger. They are actually reacting to the two fire-lizards on the heights above Fort Weyr–Meron’s fire-lizard is agitated because her master is projecting a vision of the Red Star to her and F’nor’s Grall is simultaneously experiencing that vision. They are both in a panic. After Meron leaves, F’nor projects a specific picture to Grall, goes between in utter panic. At that point, F’nor makes his fateful decision to make the journey on his dragon, Canth to the Red Star. Before they leave, he has Canth broadcast what they are doing. Although Menolly cannot communicate with dragons, the intensity of having nine fire-lizards helps her to pick up these signals, then, when Brekke cries out, “Don’t leave me alone!” Menolly herself cries it out and wakes up all of the masters in the Hall. The last scene that I loved occurs at the end of the novel, so I won’t give it away. All of the great things I said about Dragonsong equally apply to Dragonsinger. It is written simply and beautifully. It evokes emotion without beggin it, in fact, without seemingly trying at all. Menolly and the other characters are all beautifully written. It is great not only as a Young Adult novel, but also as a novel that anyone can enjoy. And as far as I know, most readers enjoy it fully!